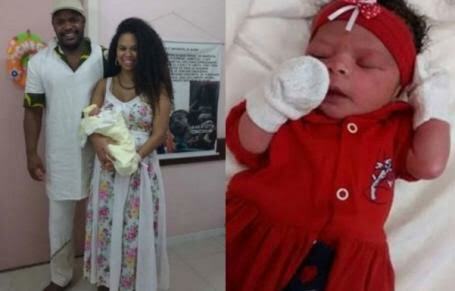 A couple has been told by Brazilian officials to change their newborn daughter's Yoruba & Ethiopian names because they made "no sense at all" and could cause "possible future suffering". However, the couple, Cizinho Afreeka and Jéssica Juliana insist the real reason their daughter’s chosen name, Makeda Foluke, was denied is racism. When the new parents found out they were expecting a baby girl, they wanted to give her an African name. So they picked Makeda (after the Ethiopian Queen of Sheba) and Foluke, a Yoruba name. But after baby Makeda Foluke was born, Brazilian officials in Rio de Janeiro, where Afreeka and Juliana live, refused to register the baby, citing concerns with her name. According to the blog Black Women In Brazil, anytime a baby is born in the South American nation the baby’s name must be registered with officials. Although it seems like a simple process, when the parents tried to register their newborn daughter’s name, they were turned down. Officials at the registration office said the baby girl’s name made "no sense at all" when pronounced in Portuguese and “could provide possible future suffering for the person in social life." The couple think the decision is based on racism. "It’s a form of racism that takes place in Brazil: the racism of subtleties," Afreeka said. "It should be very natural a man and a black woman adopting an African name, as the country is made up of three races. It is difficult to prove. Only those in this skin is knows." "The procedure is necessary with any name that can be used to leave the child in a vexatious situation or bullying. You have to filter. These procedures are normal, no one refused to do the registration. It is not the name, not the meaning. It’s pronunciation, diction. Racism is rarely in people’s minds." Brazil officials suggested the couple give Makeda a more European-sounding first name and use the African-sounding one as her middle name. The couple refused. "It’s not a name phonetically alien to Portuguese, we thought about it. There are African names that change the pronunciation and cause greater estrangement," Juliana said. "We decided together quite in early in the pregnancy and we came to call her Makeda. Family and friends already speak naturally because we were inserting this. What’s the problem with naming her Makeda if they register so many European names?" Clutch magazine reports that the parents will have to appeal to a judge to see if they can officially give her an African name. But if things don’t turn out in their favour, Makeda’s parents said they’re still not changing their mind. "I will keep on until the end,” Afreeka vowed. "Either it will be Makeda Foluke or she’ll be with no registration."